Does your packaging match your application...? Are you sure that your pallet wrap provides you maximum performance at minimum cost? Request a FREE pallet wrap audit and let us provide you with a report showing exactly how efficient your pallet wrap is. Fill out the form and an industry specialized sales manager from Lachenmeier will contact you regarding the free packaging audit. Since installing the Lachenmeier system, the end of line packaging process has operated much more efficiently. The finished products are more stable, much more appealing to the eye and have saved us on operating and labor costs and have reduced cost per load. The pallet wrap audit will allow us to get to know your business and to understand your specific requirements and needs, and it will enable us to advise you on where and how to save costs and improve efficiency on your packaging line. We know how to create cost effective packaging solutions that will allow our customers to be, and stay competitive in the market. Less is more is the intelligent packaging solution from Lachenmeier. It relies on the best mix between packaging function and cost and it's a result of our many years of experience as a global market leader in pallet wrapping. 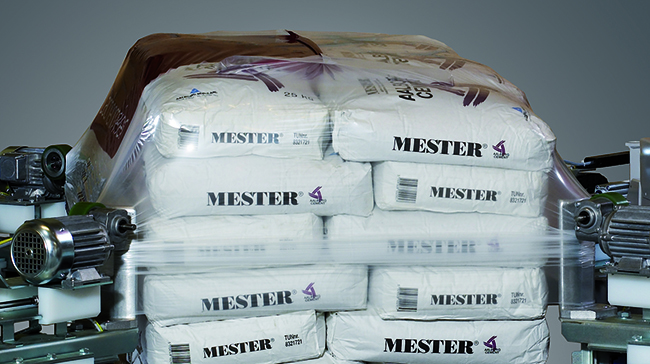 Less is more is a matter of lowering your packaging costs without compromising load stability. What is it costing you not to have Lachenmeier review and assess your packaging process..? Whether you are looking for increased load stability, reduced packaging material, minimum waste, basically an improved packaging process where you can reduce the overall cost of your packaging we can, based on our 25 plus years of industry best practices, take a close look at your existing solutions and make appropriate suggestions and recommendations as to possible cost savings and efficiencies. Lachenmeier serves a broad range of market segments. Read more and find out how your industry is doing it the right way, or request already now your FREE pallet wrap audit. Lachenmeier is committed to offering you the best possible wrapping solution to suit your individual packaging requirements. To meet your needs effectively, we need to analyze your existing processes and set-ups in order to find out, whether you are using too much film, too thick a film, if the load stability is sufficient, if the load is wrapped correctly according to norms and standards, and where we see possibilities for saving money. Basically, we need to find out if your packaging match your application. Request an experienced Lachenmeier packaging specialist with industry knowledge of best practices to provide you with a FREE audit or read more about our line of wrapping machines and film. Lachenmeier’s core business is pallet safety. We concentrate on providing state-of-the-art pallet wrap solutions with the best mix between function and cost. We focus on machine performance in combination with the right packaging film, and we look for saving possibilities while we at the same time look for ways to reduce your film usage and to improve the quality of the wraps. If you are interested in a FREE, no obligation pallet wrap audit, please fill in the form for this to be arranged. Lachenmeier is a global leader in providing pallet wrap equipment and film. We are dedicated to manufacturing high-quality innovative pallet wrap systems, which increase productivity and profitability. Our product line includes stretch hood machines and shrink wrapping machines.